A few months ago, I wrote a post about the history of the Boston Pencil Sharpener Company. It soon became one of the most popular posts on this site, which comes to no surprise. The history of the company is fascinating. Boston Pencil Sharpener Company has a reputation for making high-quality, American-Made sharpeners that clearly have aged remarkably well. Boston Pencil Sharpener Company was founded in 1899. Before then, people were more accustomed to expensive sharpeners or having to sharpen pencils by knife, which wasted the lead. In addition to the simple utility of the sharpener, the Boston pencil sharpeners are highly collectible to this day for their mechanical design and nostalgia. Many Americans remember using these sharpeners in grade school. 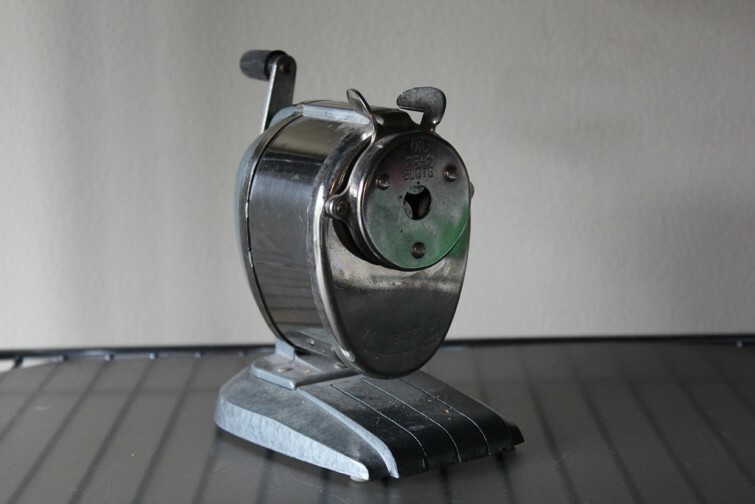 Many Boston pencil sharpeners contained different pencil holes for varying sizes of pencils. They would be adjusted by rotating a plate– despite most pencils being the same size. This particular model, which was released sometime in the 1950s, contained two knobs at the top that you would press together to open up the hole for the pencil. 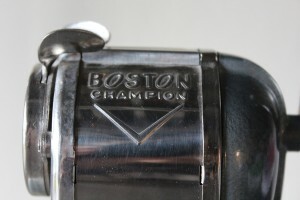 The Boston Pencil Sharpener Company was eventually sold to X-Acto, which continues to sell the classic design of the Boston Pencil Sharpener (see it here). Customers have noted that X-Acto’s model has a drastically reduced quality to the original Boston. I found this Boston Champion pencil sharpener at a garage sale for $1. I sold it a few months later to a collector online for $30. I’ve continued to find these sharpeners at local thrift stores. There are a lot of different variations with different styles and features. Mechanisms that are still in their original box are generally more coveted. Electric Boston sharpeners are far less common, but are also highly collectible.